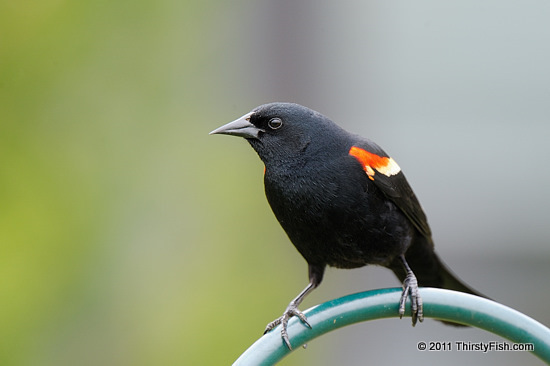 The Red-winged Blackbird is one of the most abundant and most studied birds in North America. It is a sexually dimorphic bird; the female is not black, nor does it have the red patch on its wing. The Year 2011 started with two incidents in Arkansas where 5,000 Red-winged Blackbirds fell from the sky and 100,000 dead drum fish were discovered in the Arkansas River. These stories were picked up by the Media and speculation linking these events to pesticide use and even military experiments followed. Investigators explained that trauma was the cause of death for the Blackbirds who were startled by New Year's fireworks. [Red-winged Blackbirds do not see well in the dark]. They also announced that disease was the cause of the fish deaths.